Draft: 2002, Oakland Athletics, 1st rd. June 3, 2013 Round Rock Express released 3B Mark Teahen. May 24, 2013 3B Mark Teahen assigned to Round Rock Express. May 23, 2013 Texas Rangers signed free agent 3B Mark Teahen to a minor league contract. May 20, 2013 Hillsboro Hops released 3B Mark Teahen. May 13, 2013 3B Mark Teahen assigned to Hillsboro Hops from Reno Aces. 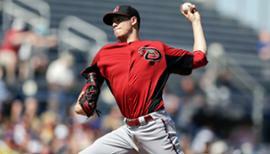 May 1, 2013 Cincinnati Reds traded 3B Mark Teahen to Arizona Diamondbacks. May 1, 2013 Louisville Bats traded 3B Mark Teahen to Reno Aces. May 1, 2013 Mark Teahen assigned to Louisville Bats. April 30, 2013 Arizona Diamondbacks traded 3B Mark Teahen to Cincinnati Reds. April 30, 2013 OF Mark Teahen roster status changed by Reno Aces. November 24, 2012 Arizona Diamondbacks signed free agent 3B Mark Teahen to a minor league contract and invited him to spring training. November 2, 2012 3B Mark Teahen elected free agency. April 4, 2012 3B Mark Teahen assigned to Syracuse Chiefs. February 6, 2012 Washington Nationals signed free agent 3B Mark Teahen to a minor league contract and invited him to spring training. January 17, 2012 Toronto Blue Jays released 3B Mark Teahen. January 9, 2012 Toronto Blue Jays designated 3B Mark Teahen for assignment. July 28, 2011 Toronto Blue Jays activated 3B Mark Teahen. July 27, 2011 Toronto Blue Jays traded RHP Jason Frasor and RHP Zach Stewart to Chicago White Sox for RHP Edwin Jackson and 3B Mark Teahen. June 5, 2011 Mark Teahen roster status changed by Chicago White Sox. May 28, 2011 sent 3B Mark Teahen on a rehab assignment to Charlotte Knights. May 17, 2011 Chicago White Sox placed 3B Mark Teahen on the 15-day disabled list retroactive to May 12, 2011. Strained right oblique. August 13, 2010 Chicago White Sox activated 3B Mark Teahen from the 15-day disabled list. July 31, 2010 sent 3B Mark Teahen on a rehab assignment to Charlotte Knights. June 1, 2010 Chicago White Sox placed 3B Mark Teahen on the 15-day disabled list retroactive to May 31, 2010. Fractured right middle finger. November 6, 2009 Kansas City Royals traded cash and 3B Mark Teahen to Chicago White Sox for 2B Chris Getz and 3B Josh Fields.